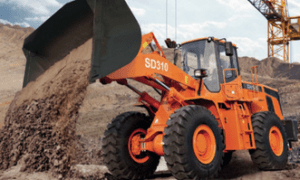 The DISD SD310 wheel loader series by Doosan. The DISD SD310 wheel loader series. Excels in tough operating conditions. Known for high performance. The robust DISD SD310 wheel loader series by Doosan is known for high performance and cost efficient operation in tough operating conditions. The SD310 machines have a fuel-saving, environmentally-friendly, low-speed Tier 11 6 cylinder turbo, direct injection engine, that delivers 160 kW (215 HP) @ 2 000 rpm, with excellent fuel economy. High power and torque characteristics, coupled with efficient synchronisation of the drive train with the hydraulic system, ensure optimum productivity, even in arduous working conditions. A high efficiency cooling fan, which is designed for increased air flow and reduced noise levels, ensures continuous work in Africa’s hot climatic conditions. Other notable features include a 3,0 m³ bucket capacity, with optimised breakout force and improved machine balance. The operating weight of this series has been increased, with greater tipping load capacities. Fully automatic ZF transmission facilitates streamlined speed change, with four forward gears and three backward gears. Maximum tractive force ensures easy driving over soft, muddy ground, reducing the risk of skidding and also prevents excessive tyre wear. The SD310 wheel loader series has a solid frame structure for improved strength and for enhanced safety on site, the new streamlined design of the machine has broadened the rearward visual field by approximately 20%. These machines have been designed for quick and effortless maintenance and to prevent contamination to the surrounding environment. A 180˚side-opened maintenance window provides a direct view for efficient daily inspection procedures and a full tilting engine cover enables easy repair to the engine and components. For user convenience, brake discs can be replaced without disassembling the hub. Features for enhanced operator control and greater comfort include a spacious, low-noise cab, with efficient air-circulation and a newly-designed instrument panel, which provides critical information, including fuel and voltage level gauges, water and oil temperature, oil pressure, rpm and an hour and speed meter. The advanced steering system has a 40˚ steering angle for improved working efficiency. The Doosan range of earthmoving equipment – which encompasses track, wheel and mini excavators, articulated dump trucks (ADT’s), as well as wheel loaders and various attachments – has been designed to cope efficiently and safely in Africa’s harsh operating conditions. Typical applications for the SD310 wheel loader series include industrial, construction, civil engineering, agricultural, mining and quarrying environments.